How to fit SEEP point motors. Michael Campbell details his approach. 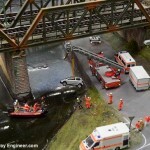 Motor operated points make a huge difference to layouts. 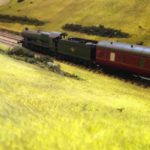 As MRE reader Andy Richardson explained in this profile of his layout, they make a tremendous difference to the enjoyment of operating a layout. But as anyone who has ever tried fitting them knows, installation is often problematic. The concept is easy enough. Cut a small hole under the point; position the motor in place under the baseboard so the pin from the motor slips through the hole and then secure it in place. When the motor is activated, the pin moves back and forth operating the point. Until you come to do it. 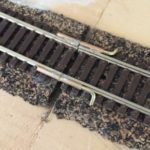 Getting the slot to line up with the tie-bar (the moving bar on the point that moves the rails) is fiddly enough. And then trying to secure the SEEP motor in the precise location under the board to match up with this slot is even harder. And then there’s wiring, connecting the motor(s) under boards is not my idea of fun. 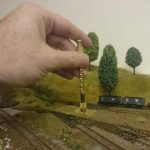 Luckily, Michael Campbell has done this recently fitted SEEP point motors on his Hexworthy layout and has found novel solutions to these problems which he explains below. Before getting into fitting the motor, however, a quick word from Michael on the differences between point motors and his choice of SEEP motors. I’ll let Michael explain. Slow-acting motors have become popular, and we’re using Tortoise motors on the latest club layout, which seem well designed and made. However they are very deep, and even the 3.5″ depth of the Hexworthy base-board is insufficient, so they don’t suit shelf layouts. They are also pricey, and I’ve heard mixed reviews of cheaper versions, even though I only need four I find it tricky to justify £10-20 per point. Servos have started to become popular in recent years. They are cheap but need a mounting arrangement, and a circuit to drive them – while there are various options for this (including from PECO) they do push the cost up and they aren’t simple. I’ve also heard reports of them “jittering” or moving due to voltage spikes or noise from motors. Solenoids are relatively cheap, reliable, and simple. My choice is SEEP motors, they are easy to fit under the baseboard with no extra fittings, and have the necessary built in switch for frog polarity switching. 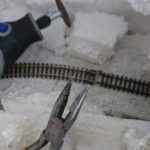 Those on Awngate were salvaged from a previous layout and so are probably over 20 years old, I admit they’re not used intensively but I’ve only ever had one failure – and that was repaired. I already have the Capacitor Discharge Unit (CDU) in my power-pack to drive them, and a simple passing contact switch or push button is all that’s needed to operate them. For those interested, there’s a further discussion of the differences between SEEP and Peco point motors here. But back to fitting them and on with Michael’s guide. I’ve found that the SEEP motor requires enough movement to switch the switch properly. On Awngate with a 6mm baseboard, the movement of the 009 point tie-bar was barely enough, requiring some careful set-up. It struck me that the motor can travel further than the tie bar as the pin invariably flexes a little, so if the motor was further from the point the excess movement could be increased, and the need to site the motor perfectly would be reduced. Firstly a ruler was set along the tie-bar and a pin pushed through the foam an inch or two from either end. Underneath the board the pin holes were joined with a pencil line marking the line of the tie-bar, the point motor should align with this to work effectively. Next, the hole for the actuator pin was opened up from below with a scalpel, wider at the underside than above, ensuring the pin cannot foul on the foam-core (which is double-thickness, so 10mm deep here) even if the motor travels further than the point tie-bar. The hole was later painted black. Note the wire in the centre of the picture, which is the dropper from the point crossing vee/frog. Previously I’ve glued the SEEP point motor base directly to the underside of the baseboard. I figured it would make them easier to change in the event of a failure if they were screwed in place, so I made some mounts from 9 mm ply. The big hole clears the actuator pin and the motor is attached with a couple of small screws, a couple of pencil lines mark the centre-lines. You’ll note the motor is now about 19 mm below the point. The motors were held centrally by a piece of plastic cut to fit between the coils and a hole for the pin. The pin was pushed into the tie-bar hole and the ply stuck in place (PVA is fine), aligning the centre-lines as it sets. After the glue is dry the plastic pieces are removed, the excess pin is marked, the screws were removed to release the motor, and the pin cut down. They’re tough steel so a slitting disc in a mini-drill is best for the job. While the motors were out I soldered wire tails to the contacts – much easier on the bench. I’ve added these the same to all the motors, long enough to reach a 6-way terminal block connector, which you will note is sited so that the wire dropper from the point frog connects straight in. The grey wire is the switched (frog) output, the white pair are for the stock rails, the green pair are the switched motor feeds to the solenoids, and the black is the return from the solenoids. In theory, I’ll be able to change a motor with 8 screws — two holding it, and 6 wires — provided it has the same length pin and wires pre-attached, so I may prepare a spare for exhibitions. Now though I need to finish the wiring and check they all work. As mentioned, there are some handy insider tips here. 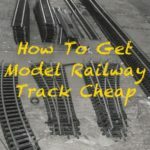 Try following this guide with your SEEP motors and let me know how you get on. Words and pictures copyright, all rights reserved, reproduced here by kind permission Michael Campbell.